The BotDetect ASP.NET Captcha installations include many example projects which can help you get started with integrating BotDetect in your applications and configuring various Captcha options. Samples are divided by the .NET runtime version used, and each example comes in both C# and VB.NET versions. You can choose which .NET runtime versions you want to support. Each of the options has separate BotDetect assemblies, configuration files and web applications. Selecting Examples under each .NET version installs the BotDetect web application files – ASP.NET code examples source code. Selecting Deploy to IIS under each .NET versions deploys the BotDetect web applications to localhost, creating IIS applications and application pools running the selected .NET runtime version. If setup detects that you don't have IIS and the required .NET Framework version installed on the machine, the Deploy to IIS option won't be shown. Be sure to check our Developer Crash Course to quickly learn the few key integration steps. These code examples show how to integrate BotDetect in your ASP.NET WebForms applications. This example project shows the most basic source code required to protect an ASP.NET form with BotDetect Captcha and validate the user input. This example project shows how to use the CaptchaValidator control to integrate BotDetect Captcha validation with standard ASP.NET page validation functionality and other validator controls. This example project shows how to integrate BotDetect Captcha validation with standard ASP.NET Membership functionality used in ASP.NET Login and CreateUserWizard controls. This example project shows how to add BotDetect CAPTCHA protection to the registration form included in the default project template coming with Visual Studio 2015 / Visual Studio 2013 / Visual Studio 2012. Since the Register form uses a CreateUserWizard, the example shows how to include BotDetect CAPTCHA validation in new user data validation. The example also shows how to complement server-side CAPTCHA validation with client-side Ajax CAPTCHA validation using ASP.NET unobtrusive validation applied to all form fields. These code examples show how to integrate BotDetect in your ASP.NET MVC applications. ASP.NET MVC View code displaying CAPTCHA protection can be found in Views/Account/Register.aspx, and the ASP.NET MVC Controller code checking user input is in Controllers/AccountController.vb. This example shows how to configure Captcha challenges by overriding Captcha control defaults in application configuration files. 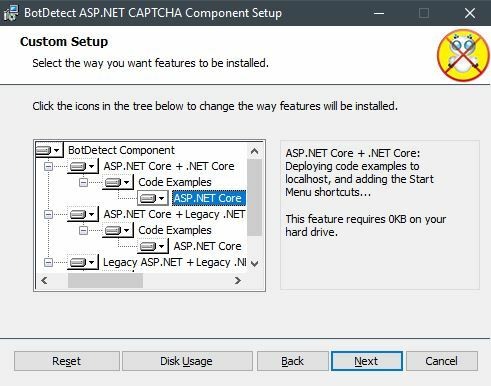 This BotDetect Captcha ASP.NET code example shows how to configure Captcha challenges by setting Captcha control properties in ASP.NET form source. Multiple ASP.NET forms within the same ASP.NET website can be protected by BotDetect Captcha challenges: e.g. you could add Captcha controls in both your Contact form and Registration form source. This BotDetect Captcha ASP.NET code example shows how to dynamically adjust Captcha configuration, potentially on each Http request made by the client. Any code setting Captcha properties in the Captcha.InitializedWebCaptcha event handler will be executed not only for each protected form GET or POST request (like Captcha configuration code placed in form source would be), but also for each each GET request loading a Captcha image or sound, or making an Ajax Captcha validation call. This example project shows the most basic source code required to protect an ASP.NET Web Pages form with BotDetect CAPTCHA and validate the user input. ASP.NET Web Pages code displaying CAPTCHA protection and checking user input can be found in Index.cshtml. This example project shows the most basic source code required to protect an ASP.NET Web Pages form using new Razor syntax with BotDetect CAPTCHA and validate the user input. ASP.NET Web Pages code displaying CAPTCHA protection and checking user input can be found in Account\Register.cshtml. This example project shows how to use BotDetect built-in error logging and Captcha event tracing, using the BotDetect Troubleshooting utility based on log4net. Such logging techniques can be used as a foundation for effective diagnosis and resolution of any BotDetect issues you might encounter on your servers. This page describes example projects coming with the ASP.NET version of BotDetect™ CAPTCHA component.